Readers get their books from a number of sources. Like you, I come to The Romance Dish because I trust the people here as those who are steady, open-minded readers of fiction. There are several authors I’ve picked up due to The Romance Dish. I’ve picked up books recommended by my favorite authors; I’ve picked up books recommended by my best friends; and I’ve picked up books recommended by whichever woman’s magazine I’m reading that week. Now I’m sure there have been a number of reviews about Jo Goodman’s books, done by those listed above, but like some books (i.e. Harry Potter), sometimes it takes me longer to believe the hype. I picked A Touch of Frost because the lady I take grocery shopping (a mother figure who is not my mother) has recently gotten back into reading again--chiefly romances--and I’ve been determined not to let this opportunity for her mental good health go unassisted when I can help. She is the kind of reader that romance writers write for, I believe--well, we write for all kinds--but my friend suffers from depression and bipolar disorder and has for many years before the right medications and care began to work for her. When she was younger, she used to read romances all the time; and then for about 20 years, she refused to read them at all. So when she started reading them again--and asked me specifically if I could bring her some books--I came loaded with books. I asked her preferences. Cowboys, she said. And much like when I finally picked up the first Harry Potter book--after years of ‘ignoring the hype’--I fell into the book like Alice down the rabbithole, thinking, why hadn’t anyone told me about these books before? This woman is amazing! 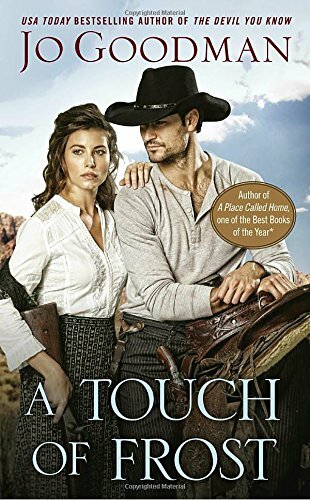 When A Touch of Frost opens, Phoebe Apple is on a train, headed west to Frost Falls, Colorado, to visit her sister, Fiona, and new brother-in-law, Thaddeus Frost, when the train is robbed and she is kidnapped for a ransom. A stranger on the train--one who had been watching her ever since St. Louis or Chicago--rescues her, only this is no stranger. Remington Frost is Thaddeus’ son, who asked him to keep an eye on the young woman to make sure she arrived to Colorado safely. Fortunately, Phoebe is rescued without much effort; however, the rest of the book turns around the mystery of who kidnapped her and why. Thaddeus, strangely, doesn’t care and isn’t even interested in getting back the $2000 he paid to the kidnappers. Unfortunately, Phoebe’s own sister seems to be the biggest suspect behind the kidnapping, which is only reinforced by Thaddeus’ insistence to let the whole thing drop. Secrets are revealed. And then more secrets are revealed. And then the mother of all secrets is revealed. Jo Goodman is extremely light-reined in maneuvering the reader into believing one thing and then revealing something else altogether. While reading and enjoying the story, I couldn’t help but admire Ms. Goodman’s deftness at weaving her story. If writing a story is basket weaving--and in romances, there are critics who certainly give the impression there is no trick to basket weaving--she takes simple materials, but weaves such a fine steady pattern that by the time the product is completed, it will definitely hold water. She creates a story that holds up in plot, characterization, historical accuracy (social mores) and romance. The setting is complete but not intrusive; the banter between the two main characters is natural and endearing; and the love scenes were at once realistic but so sensual and warm, you want to dog-ear the pages to show a willing participant later. Remington is the kind of hero to root for and to revel in, a man of honor and humor and patience. Phoebe is capable, compassionate, and curious. The mystery that unfolds (because if you guess who did it, you should be a Sherlock) is well-played; and the relationships between Thaddeus and Fiona, Fiona and Phoebe, and Phoebe and Remington are real, complicated but cohesive. Communication is key in all these relationships; and Ms. Goodman demonstrates why these relationships hold together and thrive despite some rather sticky circumstances. I can’t decide which I enjoy better: her dialogue or her ability to create realistic characters and scenes. It all just works, and she makes it look easy. Have you read Jo Goodman's books? What's the last book you fell into? Sounds vg - am putting in on my to read list. The only historicals I read are Western ones. I do like Goodman's books. This one is on my must read list too, Patoct. I've been enjoying Goodman's books since discovering her Dennehy sisters back in early 1990s. Great review, thanks. I’ve read several of Jo Goodman’s books and she does have a way with story. While the last book I fell into wasn't a romance, I fell hard. I read Elin Hildenbrand's “The Rumor” and was so taken by her writing style that I am now firmly entrenched in her back list. I'm going to see if my library has The Rumor. It sounds like a great summer read and I've enjoyed other books by Hilderbrand. Thanks for the recommendation, Maria! I'm so happy you've discovered Jo Goodman, Hellie. I've been a fan of her books for more than 20 years. I have A Touch of Frost on my TBR and your review makes me even more excited to read it! I've not read her as yet but she needs to go on my tbb pile!! I have so many books on my tbr pile that I can't wait to start - mostly historicals but I mix it up too! I have not read any books by Ms Goodman, but you have made me realize she is an author I need to add to my list....the thing is....right now if i stacked all my tbr books up, and they fell on me, I would die. I've read several of Jo's books - I know I enjoyed them because she remains on my to-read list. I have read Jo Goodman before, Hellie, and am excited there's a new book out for me to fall into! I love her westerns because, like you said, she is true to the times and her characterizations are always amazing. You really want to follow this couple and find out how they achieve their HEA! I have read her books before and saw this one at Barnes last week. I only had a few coupons so had to put it back but have it on reserve at the library...hoping it comes to me soon. Last book I fell into- Shannon Stacey, WHAT IT TAKES. Sounds good. I have never read this author. Thanks for all the good books you have recently highlighted.